Summer is a special time of year. The weather is perfect (or too hot, and even too hot means it’s a good time to jump in the pool or, if lucky, the ocean). With the kids out of school, it’s a time for family get togethers and a time to spend time with our friends. Summer celebrations are important to all of us. Cookouts, pool parties, and family reunions all take place this time of year as people appreciate the gorgeous weather, longer days, and extra free time. The dog days of summer are a time to relax and to celebrate. If you have a celebration or party planned then, of course, you need party decor. Or perhaps you are going to a party and are looking for a unique addition to bring with you to the beach, to the pool, or to the back yard. A bouquet of flowers is great as a party gift – and as an apology for when you find yourself with too many parties to go to and have to skip one. To be truly unique,you can order the Doggie Paddle bouquet. It’s white carnations and yellow poms – no, not that kind of pom, but it does have a dog in it. Just imagine the sand beneath the little guy’s paws. So, if you’re heading for a summer beach party, consider bringing or sending this unique bouquet, especially if the party thrower happens to love dogs. Unless your green thumb has been diligently tending to beds of red, white, and blue patriot floral favorites, you’re going to need a festive centerpiece to complement your 4th of July entertainment area. You could head to the store and snag the scrappy buds left behind by other last-minute decorative-minded hosts. But here’s a much better idea. Relax and enjoy the holiday weekend with your friends and family cooking out, catching up, watching fireworks, and leave the 4th of July floral bouquets in the hands of a local florist. 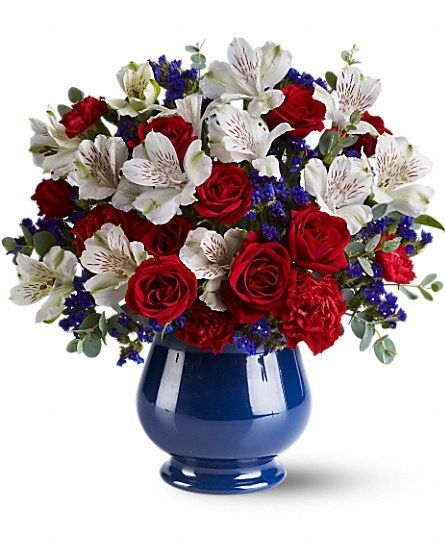 A professional florist near you can design the patriotic themed bouquets customized to your preferences that will delight you and guests, while showing our respect and gratitude for those who serve our country. After the festivities, you could present your bouquet to a veteran, military wife, or visit a local memorial to leave your token for passersby, allowing them to embrace the patriotic spirit of our most beloved national holiday.